Breaking down how Team USA and its chief competitors will look for the 16-team tournament and analyzing some of the quirks that could make the WBC better than ever. Opening Day is more than seven weeks away, but competitive baseball is much closer at hand thanks to the 2017 World Baseball Classic, which gets underway on March 6. The rosters for the 16 teams were announced on Wednesday. They include a total of 63 former All-Stars, including 26 from 2016, up from 45 former All-Stars in 2013, though the count is aided by the introduction of a new rule called the Designated Pitcher Pool. Not everybody loves the Classic, which suffers from uneven participation by the countries, the absence of some of the game's top stars (sorry folks, no Mike Trout or Clayton Kershaw) and limitations on pitcher usage. Still at a time when the weather in much of the United States remains grim, and the news from the Cactus and Grapefruit Leagues involves split squad games, 30-pitch stints by starters and yawn-worthy fifth-starter derbies, the WBC games offer a much more compelling and competitive spectacle. Plus, it's a chance for Major League Baseball to thumb its nose at the International Olympic Committee, which dropped baseball from the Games after 2008, though it will return for the 2020 Summer Olympics in Tokyo. As the event draws near, we'll have more to say about the rosters of the 16 competing teams. For the moment, here are the five biggest takeaways about the roster. Despite generally being laden with the most familiar names of any squad, the United States' teams have never really clicked in the WBC. They failed to make it out of the second round in both 2006 and '13, and finished fourth in '09, losing out to Japan, the eventual champion, in the semifinals. Will this year's squad fare any better? Even with the absences of Trout, Kris Bryant, Bryce Harper and others, it's a deeper squad than the last time around, when lesser players such as J.P Arencibia and Willie Bloomquist rounded out the roster. The catchers are Buster Posey, Jonathan Lucroy and A.J. Ellis, and the infield features five players who were All-Stars in 2016 (compared to three in '13): Rockies third baseman Nolan Arenado, Diamondbacks first baseman Paul Goldschmidt, Royals first baseman Eric Hosmer, Nationals second baseman Daniel Murphy, and the Cardinals' Matt Carpenter, who can play first, second or third base. The other three are also well-credentialed: Tigers second baseman Ian Kinsler is a four-time All-Star who won the Gold Glove last year, Giants shortstop Brandon Crawford did likewise in the NL and the Astros' Alex Bregman played in last year's Futures Game before debuting with Houston in late July. The outfield isn't as star-studded, but it does feature the Orioles' Adam Jones, the Pirates' Andrew McCutchen and the Marlins' Giancarlo Stanton and Christian Yelich, a group that has combined for 13 All-Star appearances, six Gold Gloves and an MVP award. Among the starting pitchers, only Chris Archer (Rays) has an All-Star appearance under his belt, but between him, Danny Duffy (Royals), Tanner Roark (Nationals) and Marcus Stroman (Blue Jays), the talent eyeballs as higher quality than in 2013, when Cy Young winner R.A. Dickey headlined a group that included Gio Gonzalez, Derek Holland and Ryan Vogelsong. Among the Designated Pitcher Pool option—guys who can be swapped out between rounds, a rule I'll explain below — are AL Rookie of the Year Michael Fulmer (Tigers), former All-Star Sonny Gray (Athletics) and J.A. Happ (Blue Jays). The bullpen is headlined by 2016 All-Star and postseason sensation Andrew Miller (Indians), with familiar names such as Luke Gregerson (Astros), Tyler Clippard (Yankees), Jake McGee (Rockies) and Pat Neshek (Phillies) behind him. Yes, it would be nice to have more name-brand pitching, but that's an evergreen lament. For comparison, defending champion Dominican Republic—which is also in Pool C, along with Canada and Colombia—may have slightly less firepower than Team USA: Bartolo Colon (Braves; a 2016 All-Star for the Mets), Ivan Nova (Pirates), Luis Severino (Yankees) and prospect Alex Reyes (Cardinals); among the pool options are Johnny Cueto (Giants), Carlos Martinez (Cardinals) and Wily Peralta (Brewers). On the other hand, the DR's relievers include 2016 All-Stars Dellin Betances (Yankees), Alex Colome (Rays), Jeurys Familia (Mets) and Fernando Rodney (Diamondbacks). Given the limited number of games and innings to go around, the outcome will still depend on which players rise to the occasion. 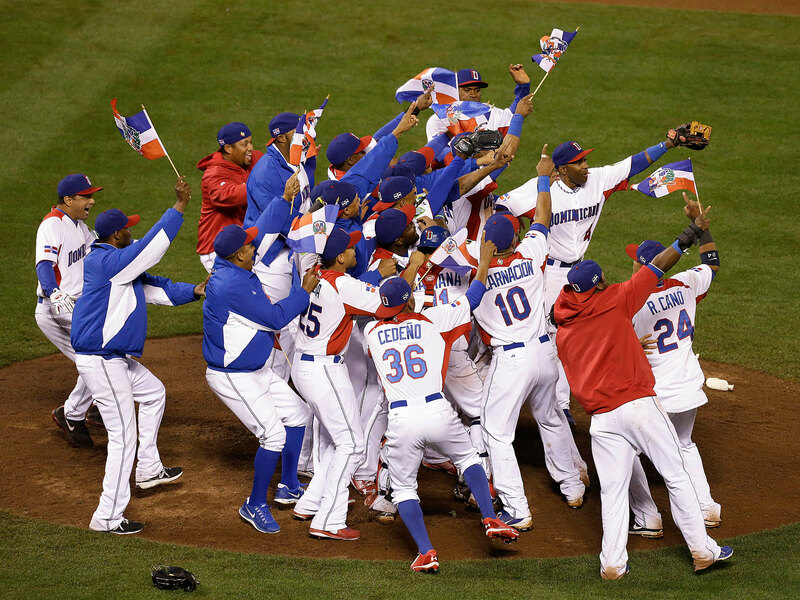 The Dominican Republic won the 2013 World Baseball Classic. Team USA and the Dominican Republic—whose active roster also includes second baseman Robinson Cano (Mariners), third baseman Manny Machado (Orioles) and outfielder Starling Marte (Pirates)—don't have a monopoly on participants from the 2016 All-Star Game. Pool D appears to be particularly stacked. The Venezuela squad has second baseman Jose Altuve (Astros), first baseman/DH Miguel Cabrera (Tigers), outfielders Carlos Gonzalez (Rockies) and Odubel Herrera (Phillies) and catcher Salvador Perez (Royals), plus past All-Stars in shortstop Alcides Escobar (Royals), pitcher Felix Hernandez (Mariners), DH Victor Martinez (Tigers), infielder Martin Prado (Marlins) and closer Francisco Rodriguez (Tigers). The Puerto Rican squad has outfielder/DH Carlos Beltran (Astros) and shortstop Francisco Lindor (Indians) as well as a past All-Star in catcher Yadier Molina (Cardinals), and likely future All-Stars like second baseman Javier Baez (Cubs) and shortstop Carlos Correa (Astros). Team Mexico has starting pitcher Marco Estrada (Blue Jays) as well as past All-Stars like pitcher Yovani Gallardo (Mariners) and first baseman Adrian Gonzalez (Dodgers) and relievers Sergio Romo (Dodgers) and Joakim Soria (Royals). As for the other pools, A and B are both light not only with All-Stars but with current major league talent. The Netherlands has the only All-Star currently on a roster in shortstop Xander Bogaerts (Red Sox) and also has Dodgers closer Kenley Jansen in the Designated Pitcher Pool. Both Japan (which won the WBC in 2006 and '09) and Korea are sending squads largely made up with players from their own professional leagues this time around, with the likes of Marlins outfielder Ichiro Suzuki, Rangers pitcher Yu Darvish and Rangers outfielder Shin-Soo Choo bypassing this year's event. Pool C is the only one with at least one All-Star on every team (Italy, from Pool D, lacks one). In addition to the aforementioned 2016 All-Stars, the Dominican Republic squad also features past All-Stars in outfielder/DH Jose Bautista (Blue Jays), third baseman Adrian Beltre (Rangers), DH Nelson Cruz (Mariners), first baseman Hanley Ramirez (Red Sox) and infielder Jose Reyes (Mets). Team Canada has four past All-Stars: pitchers Ryan Dempster and Eric Gagne (who haven't pitched in the majors since 2013 and '08, respectively), first baseman Freddie Freeman (Braves) and first baseman/DH Justin Morneau. Alas, insurance issues related to off-season knee surgery caused Russell Martin (Blue Jays) to be scrubbed, a particular shame as the four-time All-Star catcher was slated to play shortstop for the team, and 2016 All-Star outfielder Michael Saunders needed to be in camp with the Phillies, his new team. Colombia, a first-time qualifier in the tournament, has two pitchers who were 2016 All-Stars, Julio Teheran (Braves) and Jose Quintana (White Sox) on their active roster. One of the fun things about the Classic is seeing which long-lost players pop up seemingly at random. Some of them come out of retirement for the opportunity to represent their countries, particularly those that aren't well-stocked with high-level talent, others resurface from foreign leagues or independent ones. Gagne has been out of the majors so long that he went one-and-done on the 2014 Hall of Fame ballot. The now-41-year-old former NL Cy Young winner has pitched a game in each of the last two seasons in the independent Canadian-American Association, and managed Team France in the WBC qualifying round last spring. Team China features 39-year-old Bruce Chen, whose major league career spanned from 1998 to 2015. Panama-born and of Chinese descent, he pitched for his native country in the 2006 and '09 Classics, but their failure to qualify freed him up to switch teams this time around. The Netherlands team features Rick van den Hurk (last in the majors in 2012, with two years apiece in Korea and Japan since), Jair Jurrjens (last in the majors in 2014) and Loek Van Mil, who never pitched in the majors but at 7'1" stands as the tallest player in professional baseball history. Puerto Rico has 41-year-old lefty J.C. Romero, last in the majors in 2012, and 38-year-old righty Joel Piniero, last in the majors in 2011; both last played professionally in 2015, with the former in Mexico and the latter with the Blue Jays' Double A and Triple A squads. Among other lefties returning from oblivion are Venezuela's Wil Ledezma and Australia's Ryan Rowland-Smith. Ledezma, now 36, last pitched in the majors in 2011 but remains active in the Mexican League. Rowland-Smith, now 34, made six appearances with the Diamondbacks in 2014, his only major league experience since 2010. Mexico has infielder Luis Cruz, who's spent the past three seasons in Japan after exiting the major league scene. Alas, Panama's failure to qualify means that we'll miss Ruben Rivera, who last played in the majors in 2003, participated in the '06 and '09 classics, and hit .286/.384/.448 in his age-43 season in Mexico in 2016. So what are the Designated Pitching Pools? Each team can name as many as 10 pitchers to its pool but can only include one or two on its 28-man active roster; if none are included include, that team forfeits the right to use the pool throughout the tournament (which appears to be the case for Canada, China and Korea, based on the roster pages at MLB.com). A pool pitcher can be replaced on the active roster by another pool pitcher between rounds, but if he's removed, he's done for the tournament. Inactive pool pitchers remain with their major league teams while WBC games take place. To use an example, Roark and Duffy are the active pool pitchers for the U.S. They can pitch in the first round and stick around throughout the tournament, or be replaced by Fulmer, Gray, Happ, Brett Cecil (Cardinals), Drew Smyly (Mariners) or Alex Wilson (Tigers), none of whom will be available in the first round. As noted before, Colombia and Israel are the tournament's two first-time qualifiers. Colombia won a four-team qualifying pool last March, beating out Spain, France, and host country Panama. Israel won a qualifier last September in Brooklyn, beating out Brazil, Pakistan and Great Britain. Mexico and Australia, which like Brazil and Spain finished last in their 2013 first round pools, had to go through the qualifying process as well; they won their respective four-team pools. Rules-wise, a couple things have changed relative to 2013. This time around, the full selection of instant replay reviews will be available for the championship round, though there will be no manager challenges. For the first two rounds, the rules are the same as they were for 2013, in that replays can only be used via boundary calls—home runs or potential home runs. Another change involves extra innings. From the 11th inning onward (instead of the 13th, which was never actually used in 2013), teams begin the inning with runners on first and second base; they're the players one and two spots ahead of the scheduled batter, respectively, so if the cleanup hitter is due up, then the number two hitter is on second and the number three hitter will be on first. This, of course, is suddenly a hot topic given MLB’s trial balloon from earlier this week, though that proposal, some form of which will be tested at the complex league level this summer, involves putting a runner at second from the 10th inning onward. The rules regarding pitch counts and pitcher usage are the same as they were in 2013. In the first round, pitchers are limited to 65 pitches, with 80 and 95 pitches in subsequent rounds; in all cases, pitchers are allowed to complete a plate appearance in which they go past those numbers. Any pitcher throwing at least 50 pitches in a game has to rest at least four days, anyone throwing 30 pitches has to rest a day, and nobody can throw on three straight days regardless of pitch counts. To avoid forcing pitchers to throw garbage-time innings, the mercy rule remains in place: In the first two rounds, a game ends if a team is ahead by either 15 runs after five innings, or 10 runs after seven innings.